A worldwide survey of international players reveals the pressure faced by elite players, and concerns for the future of the game. International Rugby Players – the umbrella body for player unions in Australia, England, France, Ireland, Italy, New Zealand, the Pacific Islands and South Africa – has carried out a unique survey of the international women’s rugby players worldwide. Similar in scope to the French study of their elite club game (published in July) the report - Women’s Survey: Who’s Playing the Game? - looks at the profile and workload of international players, as well as their views on the game, which in particular calls for clarity on the future of the women’s fifteens game. Players from all Women’s Sevens Series core teams as well as those that competed at last year’s Women’s Rugby World Cup took part in the study. 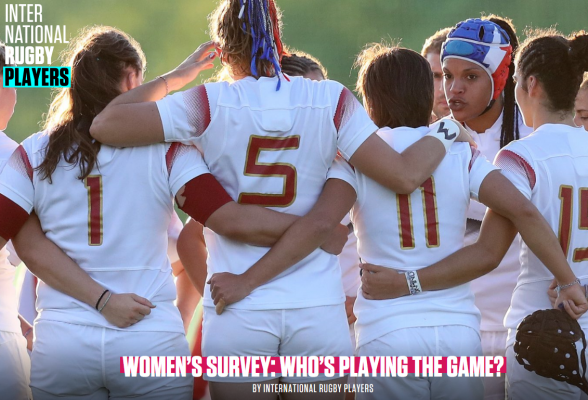 The stand-out finding from the survey was that 68% of players felt that the women’s game globally is more focused on sevens rather than the traditional test rugby. Some 75% of players in the fifteens code feel there is not enough games for their country with only players from Europe who have the benefit of the Six Nations competition feeling that there was sufficient test rugby. Some 77% of players globally feel that their union is not doing enough to promote the fifteens game. Overall, there is a real fear for the future of test rugby among players, as the high-performance investment is almost entirely going to the sevens game, with some nations utilising sevens players to ‘top-up’ their 15s programmes in World Cup years. As the French study suggested, rugby is young woman’s sport, with 44% of elite international players aged between 18 and 23 years old and just 16% of players 30 or over. 70% started playing rugby in their teenage years – rather later than in the men’s game - and players were generally introduced to the sport by friends, in university or through high school initiatives. Approximately 69% of international players consider themselves to be a “professional” or “semi-professional” (34% and 35% respectively), but only 42% can live off their income from Rugby - although this standard of living is categorised as “surviving” rather than living. In practice only a tiny number of players – about 6% - do live entirely from their rugby earnings. Just over a third of the rest are students and everyone else supplements their income with another job while playing. Just over half of the athletes (52%) play 15s and 7s while 21% are 7’s specialists and 27% are 15’s specialist players. 85% of those receiving any pay receive this from sevens, only 15% are receiving any income from fifteens. From a workload point of view, 56% of players struggled or sometimes struggled to keep up with the playing and training requirements involved while 59% said they struggled or sometime struggled with the mental fatigue associated with participating on the circuit. Training load seems to be the real issues, due to the irregular timings of tournaments, resulting in players being under-trained or even over-training in order to fulfil contractual/funding requirements. Other factors affecting mental stress include the stress of balancing employment with playing commitments national programme – which was also a feature of the French report. Annual leave is used for training and tournaments, meaning players don’t get the break they need to mentally recover. Many programmes are inflexible with time commitment so jobs are often sacrificed and many feel they are putting careers on hold in order to participate in the game. The report does not contain any suggestions for how things could be improved, but both it and the French report suggest that the current model is putting huge strain on the leading players. Talented players are clearly being lost – the very players who would do the most to attract sponsorship and commercial support. The sport is failing to reward those who do play either financially or with sufficient international playing opportunities, while what for many is the pinnacle of the game – test rugby – is threatened. These two reports, appearing within a few weeks of each other, should be matters of real concern to national unions and World Rugby. We look forward to seeing the response of those in control of the game with interest. 77% of players globally feel that their union is not doing enough to promote the fifteens game.